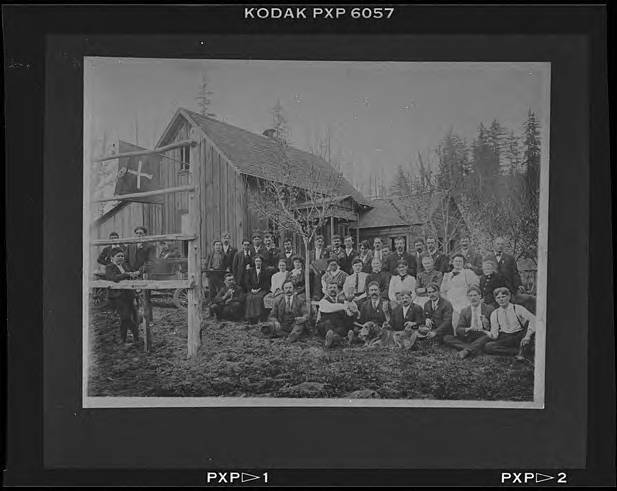 Black and white image of a group of men and women seated on the ground in front of a large wooden church. The national flag of Switzerland, red with a white cross in the center, flies from the upper window of the church. In the background an antique car can just be seen, and the trees appear to be just budding out. Many of the farmers who settled in Washington County in the late 1800s were from Switzerland. Heritage clubs such as this and the various singing and yodeling groups in the area helped to keep the culture of their homeland alive.